Large-scale specimen such as frame structure large materials can be evaluated for the fatigue performance by this LST Series. 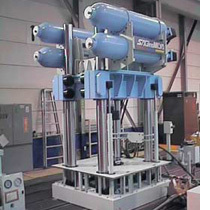 The four-column frame can equip a servo hydraulic actuator whose capacity is up to 2MN. This system has a four-column frame with an actuator and long base plate so that a large-scale structure can be fixed on it. It conducts a three-points bending test and four-points bending test with rigs. 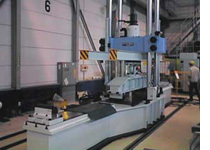 The purpose of this unique test system is to analyze and verify a rupture mode of structural component under an impulsive dynamic force, which used to be difficult in performance by conventional systems.